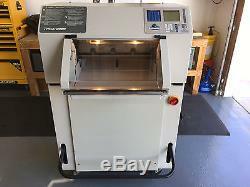 Challenge Titan 200 Programmable Hydraulic Paper Cutter - Professionally Rebuilt This Titan 200 was fully-refurbished and rebuilt from the ground up by our factory-trained, in-house service technician. We will get back to you quickly! IMPORTANT Any door opening that the cutter is to pass through MUST be at least 36.5 inches wide! 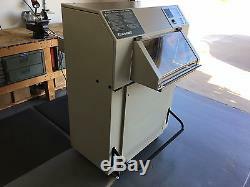 View video of ACTUAL machine in use. 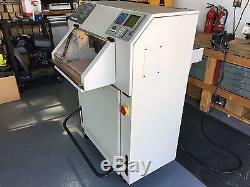 The Titan 200 is a 20 inch wide fully-automatic paper cutter with hydraulic clamp pressure and a powered blade. The easy-to-read digital display allows for ultimate control along with a line light cut position indicator and push button controls, the 200 paper cutter provides easy use as well as operator protection. The Titan 200 is the ideal cutter for a mid-to-high production facility that requires high-speed production, durability and superior safety. 20" Cutting Width, 3-1/4" Clamp Opening. Easy to Read LED Digital Display. Line Light Cut Position Indicator. Hydraulic Motor Runs Only During Cutting Cycle. Dual Cut Buttons To Activate Cutting Cycle. Heavy Duty Casters Cast Iron and Steel Construction. Plugs Into 208V/230V 1-Phase, 60 Hz, 12 Amps Electrical Socket (NEMA 6-15R or 6-20R). Includes: a brand new blade (installed), blade changing tool, 12 plastic cutting sticks (1 installed) and a jogging aid block. Titan 200 Automatic Cutter Specifications. Hydraulic & Manual (optional foot lever). Table Length in front of Knife. 208V/230V 1-Phase, 60 Hz, 12 Amps (service size 15 Amps) Requires receptacle type: NEMA 6-15R or 6-20R. 36" W x 53" H x 49 D. We realize it's a lot, but it isn't there to intimidate buyers, rather protect us both. The information is very thorough, clearly explains our policies, and will most likely answer any questions you may have. Confirmed US street addresses only, no P. Please feel free to ask questions at any time. Your messages will always be answered as promptly as possible. Spam Filters: Check your bulk folder if you haven't received any communications from me. It is YOUR responsibility to maintain your spam filters. If you have any questions about our items or the terms of this sale, please ASK FIRST! If there are any problems with your items, please give us the opportunity to assist you before reciprocating. 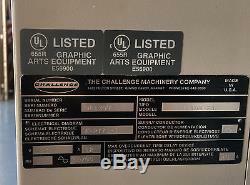 The item "Challenge Titan 200 Programmable Hydraulic Paper Cutter Professionally Rebuilt" is in sale since Friday, July 28, 2017. This item is in the category "Business & Industrial\Printing & Graphic Arts\Bindery & Finishing Equipment\Paper Cutters & Trimmers". 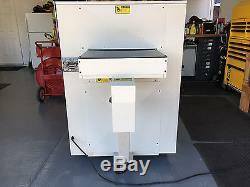 The seller is "cfsproducts" and is located in Santa Maria, California. This item can be shipped to United States.